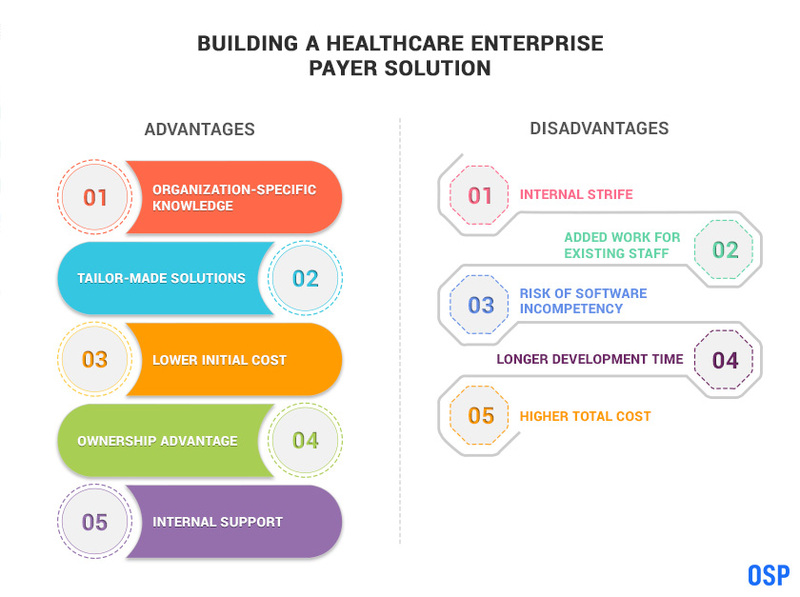 With the rise in popularity of solutions for healthcare payers, many organizations are contemplating between which is a better option for payer solutions – should it be built internally, or should it be bought from a trusted vendor? Based on the culture and strategies of the organization, and the services being offered, there is no one size fits all answer. It is relevant to the organization in question. 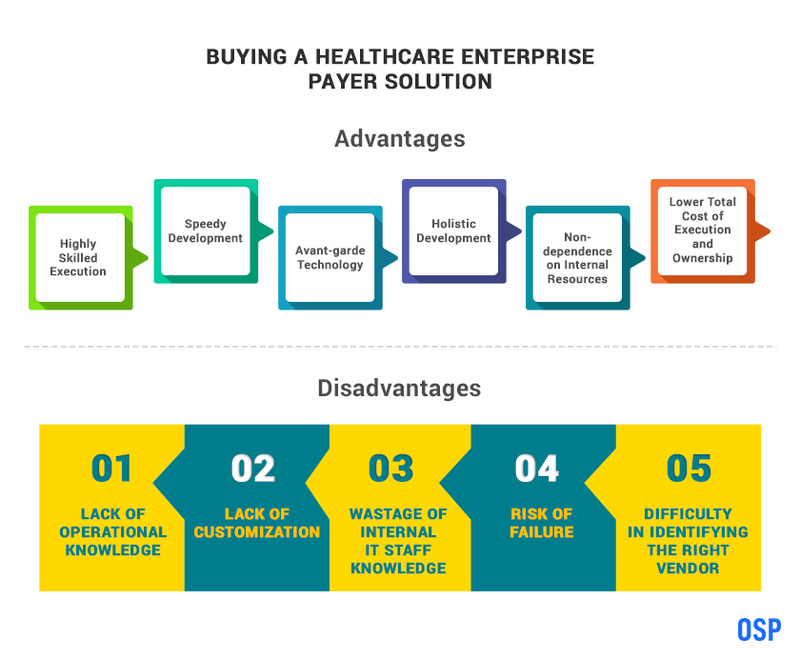 However, there are very specific pros and cons to each approach and here we analyze these advantages and disadvantages to make it easier for an organization to identify the right approach toward a solution-driven payer platform that pertains to them. A healthcare payer solution deals with the lifecycle of the organization. The organization, therefore, must consider whether they have the bandwidth to use data and transition to a solution-driven payer platform. In the past, the option of using a vendor to buy healthcare payer solutions was rarely available. Healthcare organizations were left with no option but to build their own infrastructure for healthcare payer solutions. As with every industry, the healthcare industry is now booming with vendor options that offer robust healthcare payer services. Before making the decision between building or buying, it is prudent to consider the below features of each option. For those organizations that are not inclined toward using their internal resources to build their own platform, the healthcare market is loaded with vendors that now offer top-of-the-line solutions for payment management. Even though there are several advantages to buying a solution, there are some points to consider that might be amiss in purchasing a solution as opposed to building it. Highly Skilled Execution – With an outside vendor comes engineering excellency that offers perfectly tailored solutions and bring with them a high degree of industry know-how, along with experience gained from offering solutions to similar organizations. Speedy Development – Healthcare agencies that do not have a lot of time to spare on building internally, can get a swiftly executed solution through a steady vendor. In a short span of time, the solution can be implemented with the best available technology, including adapters and accelerators for speedy execution. Avant-garde Technology – Buying a payer solution comes with the luxury of knowing that all features of the solution will be embedded with the latest technology offerings. Selecting the right vendor brings relevant industry experience and solutions with a best-fit approach. Holistic Development – Industry vendors now offer management solutions that take care of the entire lifecycle of payment functions required by an organization, which is generally lacking in a solution that is built internally. This further benefits the organization by mitigating risks and closing gaps that could potentially exist in the current system. Non-dependence on Internal Resources – An outside vendor brings their own IT experts and engineers and does not require the organizations internal resources for execution, sparing them for their routine jobs and existing duties. Lower Total Cost of Execution and Ownership – As opposed to the common notion that buying a solution is more expensive than building it, in the long term, the total cost of execution and ownership, when factoring in the maintenance costs, turns out to be much lower than building the payer system internally. Lack of Operational Knowledge – When it comes to coordinated care or accountable care, operational knowledge is key. When an outside vendor executes and installs the payer solution software, it is quite frequent for them to leave the organization without transferring enough knowledge to the in-house staff on operating the system. Lack of Customization – A payer management solution that is bought from vendors is one that may be embedded with top-of-the-line features, but what it lacks is the tailor-made approach to the specific organization. The vendor may offer a powerful solution, but it still may not have some features that are specifically suited for the relevant healthcare agency. Wastage of Internal IT Staff Knowledge – If the organization is equipped with internal software developers, they’re expertise is usually wasted in the buying option. They could provide valuable inputs crucial to the development of the software. Risk of Failure – When outsourcing any job, there is always a risk of failure. This is because the guarantee of successful execution is not 100% with any vendor. Execution strategies and expertise are all outside the organizations control and sometimes leads to disappointments. Difficulty in Identifying the Right Vendor – Even though the vast number of vendors available in the healthcare industry makes the option of buying the software convenient, it also brings with it a certain amount of confusion and risk of selecting the incorrect vendor, which ultimately leads to a dissatisfied result. Even with the increasing availability of vendors, some organizations still prefer the option of building their own management solution by leveraging their own software developers and using the organizations internal staff and knowledge. Again, there are advantages and disadvantages to this approach and a prudent decision must be made keeping both sides of the equation in mind. Organization-specific Knowledge – Leveraging internal software developers comes with competitive advantage and specific knowledge that is relevant to that organization. Tailor-made Solutions – Building in-house software is usually embedded with features that offer solutions pertaining to the organization’s own requirement and addresses the gaps in the system that may or may not exist in other payer solutions. Lower Initial Cost – Considering that the resources are internal, the initial cost of building the software is lower than what an organization would spend on buying the enterprise solution. The expertise of the IT developers is already available within the healthcare agency. Ownership Advantage – Internally built software is one that is the brain child of the organization and comes with the advantage of ownership. It provides an added advantage as a knowledge asset in the large-scale spectrum of the healthcare industry. Internal Support – While building your own enterprise software, there is a distinct advantage of internal staff support that offers valuable insights into the requirements of the solution. From front-end staff to back-end management, everyone can contribute to overall functionality. Internal Strife – When building an enterprise software solution, there can be internal political battles within the organization due to difference of opinions and thoughts on implementation strategies. Added Work for Existing Staff – The internal software developers and IT professionals, along with all the other employees of the organization must allot time for the building of the software, over and above their regular duties. This may lead to frustration among the staff and sometimes, a lack of efficiency in regular functioning. Risk of Software Incompetency – Even with the internal knowledge of the organization, the developers that are building the software lack the industry experience and hands-on experience that distinguishes the services of an outside vendor. Further, their exposure to the latest technologies is limited and they may not be aware that certain solutions can be empowered through recently developed technologies. Longer Development Time – Technically speaking, a significant disadvantage to building a care management solution is one where the mistakes and learnings will be taking place for the first time by the internal staff. Therefore, they will be a lot of re-structuring, re-approaching and redoing involved in the process. It is equivalent to hiring a vendor for who the organization is the first client. Higher Total Cost – The irony of the situation is that those organizations that generally choose to build their own solution, realize in the long run, that building it has cost them more than what it would have to buy the software. This is due to the redoing and re-structuring that takes place while building the software, the slower pace of execution and finally, the higher cost of maintenance. Conflicting Inputs: When considering deploying payer solutions, the clinical decision support along with consistency of staff inputs is usually a barrier. There is difficulty in placing automated systems, since the same questions get different answers across the organization. This lack of consistency stands in the way of creating a data-driven payer solution. Cultural Lack of Transparency: This serves as a huge challenge among the healthcare industry, since most organizations are not comfortable with sharing internal information with an outside vendor or even across departments. Additionally, most healthcare clinics, hospitals, etc. hesitate to divulge information that makes them look weak, which makes suggestions for improvement solutions extremely difficult. Lower Confidence in Automated Solutions: Usually, statistical data that is derived through payer solutions, including claims analytics, population health statistics, etc. are looked at with an eye of doubt. Healthcare specialists need to put more faith into the technology to be able to conduct payment lifecycles, handle red flags, and provide suggestions for improvement, with minimal human intervention. Evolution of Payment Strategies: Payment reforms are consistently evolving from the traditional fee-for-service reimbursement systems to the new and improved value-based care payments. These changes take some getting used to and therefore, the transition is experiencing some difficulty. Hesitancy toward Investment: A lack of faith in the technology creates hesitancy toward investing in payer solutions. A high number of healthcare specialists are not keen to invest in technologies due to the unawareness of the potential benefits or the lack of trust in these systems. Mixed Initial Results: The shift of payment models and adoption of value-based care reimbursement models, initially gave out mixed results. As with any early adoption, the initial transition experienced teething issues and did not always display performance improvement. Administrative Complexity: Payment models are complex in nature and result in a higher burden on administrative staff. Healthcare organizations often lack the technologies and ability to perform analytics for quality execution and improvement. There is a universal expression among the healthcare industry for a change in the way care is delivered and healthcare functioning is conducted. This transformation is subtle, but well under way. A drastic leap has been taken towards providing higher quality care at lower costs. The best way to begin this transformation toward value-based care delivery is to follow the crucial steps towards higher quality healthcare service delivery. This is a simple and straightforward incentive system process that provides encouragement through the reward system for improvements in performance, based on certain established metrics. It could sometimes also include some form of penalty for underachievement. Building this platform will come with the advantage of a keen insight into personal relevancy, but with the disadvantage of unsuccessful standards of incentives and penalties. Buying this platform will come with the advantage of industry experience on defining metrics, but with the disadvantage of relevancy to the specific organization. This process is where the consumer is provided with the option of making a single, one-time payment for all services offered by a single healthcare provider for an entire case of care, instead of every service being billed separately. This method encourages the healthcare organization to work as a team, instead of every healthcare entity being liable only for their end of the service. The kind of services involved for bundled payment can be defined based on the population health. Building this platform will come with the advantage of creating one’s own partnerships and goals, but the disadvantage will be the limited number of providers that can be enlisted into the bundled payment program. Buying this platform will come with the advantage of a host of providers that can be bundled together for payments, but there is a disadvantage of adherence among a broad network of providers. This is the third form of payment process where an agreement is made between a healthcare service provider and a payer that establishes a total-cost-of-care system and comes with rewards or penalties based on the total cost of patients and the care provided to them based on established standards of quality. 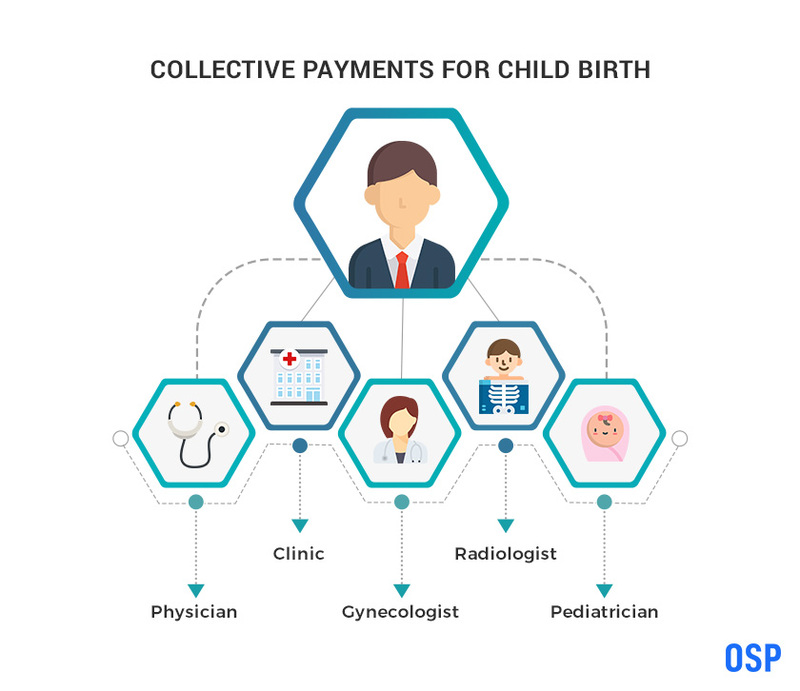 Building this platform offers the advantage of a slow orientation for the providers into this complex system of payment. The complexity of this process is likely to leave many gaps in the creation of this system. Buying this platform offers the advantage of expertise in execution due to industry experience, but there is a disadvantage of it not being suited for a healthcare provider due to its standard strategies. With the constant increase in healthcare delivery costs, innovation is crucial, specifically to payer solutions. The approach as to whether a system should be bought or built is entirely dependent on the healthcare organization, but the above-mentioned pros and cons should be closely evaluated before the choice is made. Sometimes, when a provider is addressing a small population of consumers, a custom-made built payer solution might be a prudent choice. Often, choosing an experienced and efficient vendor is a wise choice to gain from the industry experience and exposure of the vendor who has worked with other healthcare agencies in the past. Finally, there is no sure shot method to success and every organization must deem the appropriate course for itself. Creating certain business guidelines within the organization will make standardization a key guiding tool towards making the right choice.